Do you know what happens when you live in New York and you type the words "why am" into Google? Before you can type the next word, Google's Autocomplete function helpfully offers to complete your thought. 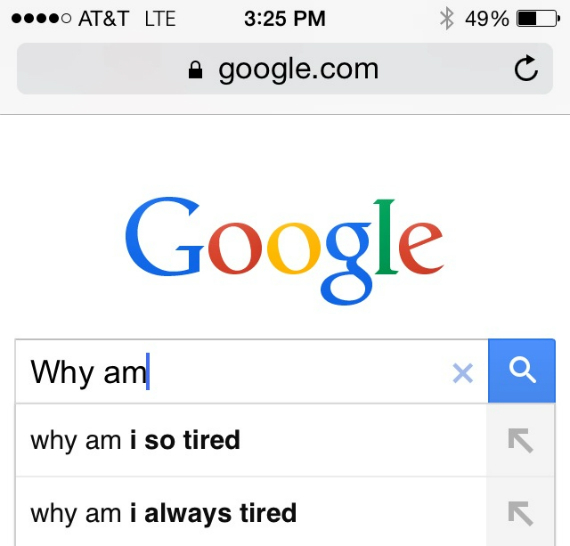 The first suggestion: "why am I so tired?" The second: "why am I always tired?" The Zeitgeist perfectly captured by Google. As the Belgian philosopher Pascal Chabot has put it, burnout is "civilization's disease." The thought of so many people hunched over their laptops or iPhones, asking Google, "Why am I so tired?" or "Why am I always tired?" is really sad. And the answer is not going to be given to us by an algorithm. But we can start by shutting off our devices and getting some sleep. Do you know what happens when you live in New York and you type the words "why am" into Google? Before you can type the next word, Google's Autocomplete function helpfully offers to complete your thought. The first suggestion: "why am I so tired?" The second: "why am I always tired?" The Zeitgeist perfectly captured by Google. As the Belgian philosopher Pascal Chabot has put it, burnout is "civilization's disease." True, the results of an algorithm lack the nuance and intellectual heft of a philosophical diagnosis, and the results are regional, but Autocomplete provides a valuable window into the questions we're asking. As Google explains, "The search queries that you see as part of Autocomplete are a reflection of the search activity of users and the content of web pages." These predictions are powered by an algorithm "based on a number of objective factors, including how often past users have searched for a term." Google has become something of the secular equivalent of a confessional box. Within the confines of a search bar you can ask questions or express opinions you would never admit to in public. Our most popular searches are, to some degree, an uncensored chronicle of what, as a society, we're thinking but not necessarily saying. While we as individuals are not always willing to talk about how tired we are, there's more evidence than ever that we've reached crisis levels. As one young woman told me during a Q&A session in San Francisco, "I don't remember the last time I was not tired." Bill Clinton, who used to famously get only five hours of sleep a night, admitted, "Every important mistake I've made in my life, I've made because I was too tired." And Hillary Clinton, after stepping down as Secretary of State, told Gail Collins that her goal was "to see whether I can get untired." One other point on Google's page explaining Autocomplete stood out to me: "Just like the web, the search terms shown may seem silly, strange, or surprising." A few minutes spent typing random words (or celebrity names) into your Google search bar confirm this. But in the case of our tired civilization, there's nothing silly, strange or particularly surprising. Actually, the thought of so many people hunched over their laptops or iPhones, asking Google, "Why am I so tired?" or "Why am I always tired?" is really sad. And the answer is not going to be given to us by an algorithm. But we can start by shutting off our devices and getting some sleep. Please let me know what happens when you Google "why am" in your area of the country or the world.